[CONT](VC/RC): If have a non-«Kagero» vanguard or rear-guard, this unit gets [Power]-2000. 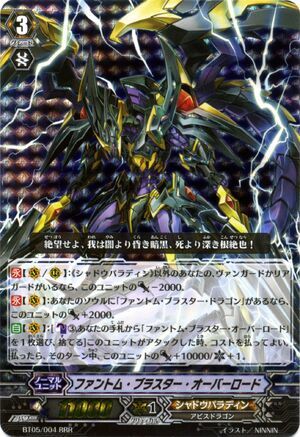 [CONT](VC): If you have a unit named "Dragonic Overlord" in your soul, this unit gets [Power]+2000. 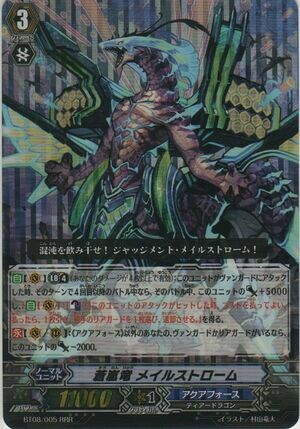 [AUTO](VC): [Counter Blast (2) & Choose a "Dragonic Overlord The End" from your hand, and discard it.] When this unit's attack hits, you may pay the cost. If you do, [Stand] this unit. 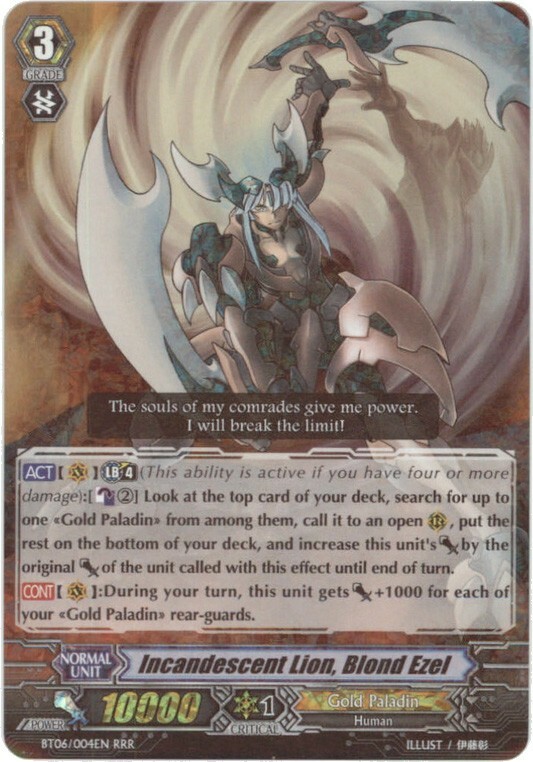 [ACT](VC): Limit Break 4 (This ability is active if you have four or more damage):[Counter Blast (2)] Look at the top card of your deck, search for up to one «Gold Paladin» from among them, call it to an open (RC), put the rest on the bottom of your deck, and increase this unit's [Power] by the original [Power] of the unit called with this effect until end of turn. [ACT](VC): Limit Break 4 (This ability is active if you have four or more damage):[Counter Blast (1)] Bind all of your opponent's rear-guards, and at the beginning of the end phase of that turn, your opponent chooses up to four face up cards that were bound with this effect from his or her bind zone, calls them to separate (RC), and puts all other cards that were bound with this effect into the drop zone. 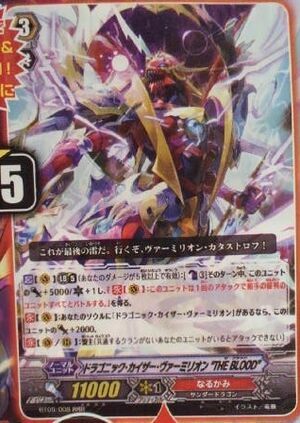 5.Dragonic Kaiser Vermillion "THE BLOOD"
[AUTO](VG):Limit Break 4(This ability is active if you have four or more damage):[CB(1)&Choose a card named "Phantasmagoric Snowy Wind, Shirayuki" from your hand and discard it] At the beginning of the guard step when this unit was attacked, you may pay the cost. if you do, choose an opponent's attacking unit, and that unit gets Power-20000 until end of that battle. 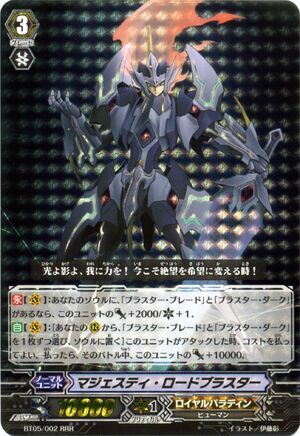 CONT 【V/R】: If you have a non-«Shadow Paladin» Vanguard or rear-guard, this unit gets Power -2000. 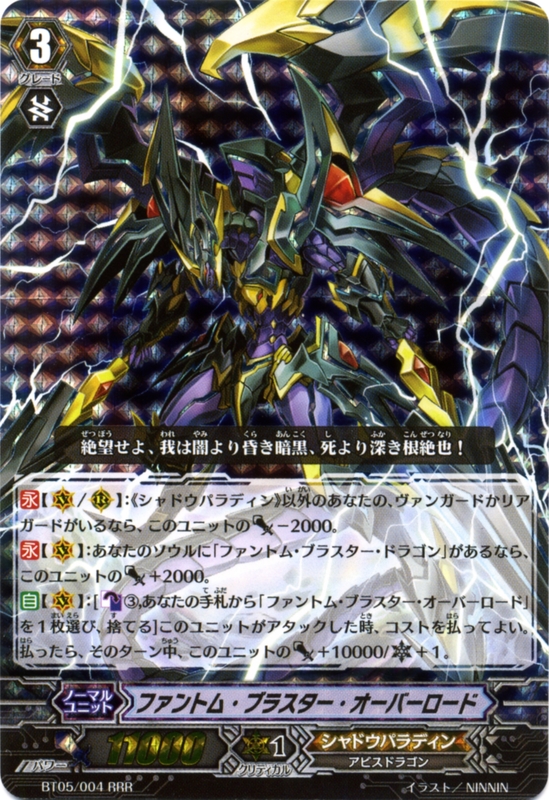 CONT 【V】: If you have a unit named "Phantom Blaster Dragon" in your soul, this unit gets Power +2000. 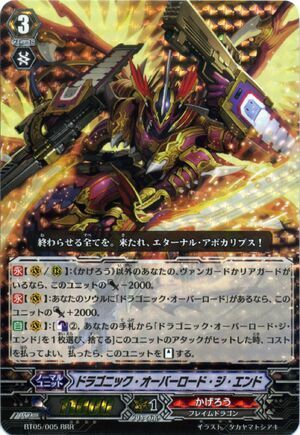 AUTO 【V】: [Counter Blast (3) & Choose a Phantom Blaster Overlord from your hand, and discard it.] When this unit attacks, you may pay the cost. If you do, this unit gets Power +10000/Critical +1 until end of that turn. [ACT](VC) Limit Break 4 (This ability is active if you have four or more damage):[Counter Blast (2)] [Stand] all your «Nova Grappler» rear-guards. 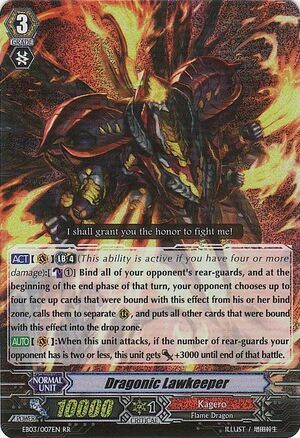 If four or more units [Stand] with this effect, this unit gets [Critical]+1 until end of turn. This ability can only be used once per turn. 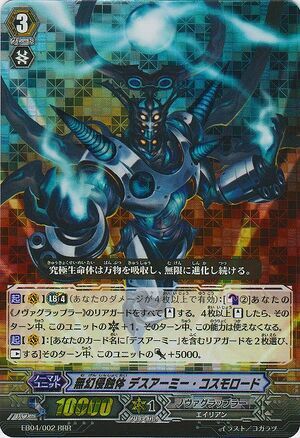 [ACT](VC):[Choose two of your rear-guards with "Death Army" in their name, and [Rest] them] This unit gets [Power]+5000 until end of turn. [AUTO](VC): Limit Break 4 (This ability is active if you have four or more damage):[Counter Blast (2)] When this unit's attack hits a vanguard, you may pay the cost. If you do, search your deck for up to one «Oracle Think Tank», reveal it to your opponent, put it into your hand, and shuffle your deck. 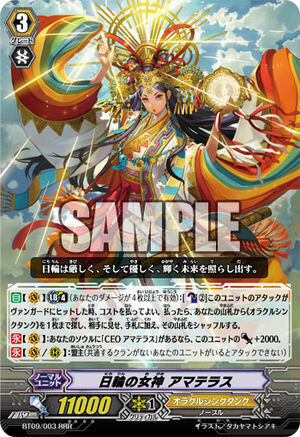 [CONT](VC): If you have a card named "CEO Amaterasu" in your soul, this unit gets [Power]+2000. [AUTO] (VC): Limit Break 4 (This ability is active if you have four or more damage): When this unit attacks a vanguard, if the number of battles during that turn is four or more, until the end of that battle, this unit gets [Power] +5000, gets "[AUTO] (VC): [Counter Blast (1)] When this unit's attack hits, you may pay the cost. 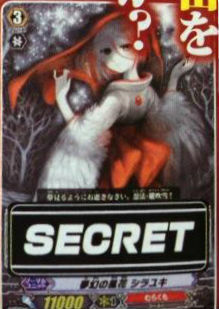 If you do, draw a card, choose an opponent's rear-guard, and retire it.". [CONT] (VC/RC): If you have a non-«Aqua Force» vanguard or rear-guard, this unit gets [Power] -2000.